One of the most interesting and artistically refreshing games of the year 2009 is a little known title called Zeno Clash. Developed by a group of Chilean developers who call themselves the ACE Team, the game uses Valve’s Source Engine to bring to life the often disturbing world of Zenozoik. The protagonist of the game is Ghat who is one of the many children of a hermaphrodite creature, aptly called Mother-Father. Curiously, the game starts off with Ghat regaining consciousness after a heated battle in which he kills Mother-Father. Subsequently having being chased out of the city of Halstedom by the other off-spring of Mother- Father (your brothers and sisters that is), you are accompanied on your exodus by a female companion called Deadra. 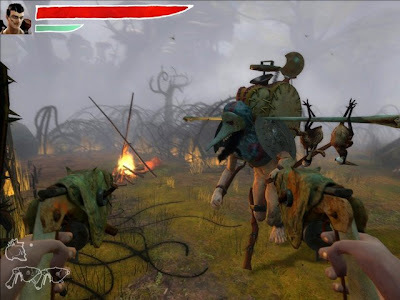 The game plays out in the first person perspective; however, the emphasis is on melee combat, rather than ranged. 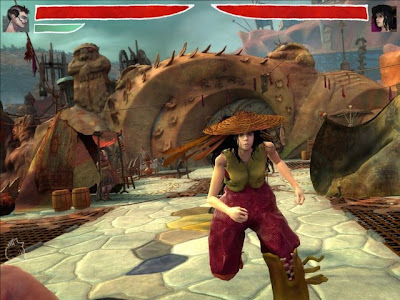 It heavily draws influence from fighting games and old-school side scrolling beat-em ups. As you’d expect from most melee fighting systems, there are combos and block-parry-counter systems. If you’ve not played games like Breakdown and Dark Messiah, it may take you some time to get used to melee fighting in the first-person perspective. 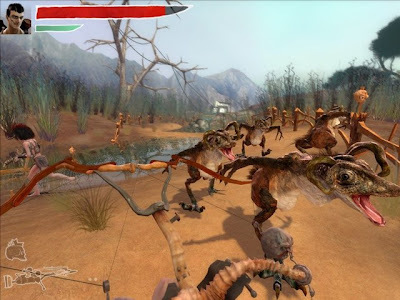 Although most of the game is fought unarmed, the game features a few melee weapons that are available only during certain encounters and for a short period. 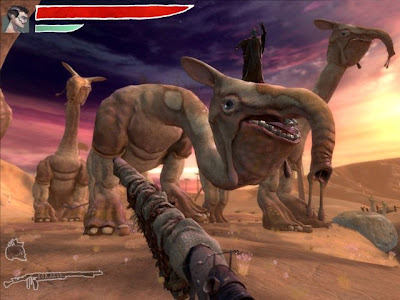 It’s not all hand-to-hand combat though, and the game features some twisted versions of standard shooter arsenal like the crossbow and hand grenades. The developers using the Source engine have done an admirable job at creating the world of Zenozoik with contemporary production value. The game takes you from the city Halstedom, through desert, forest and ultimately to the proverbial end of the world. 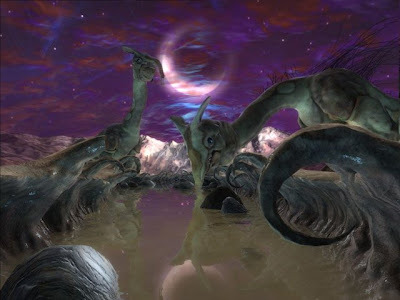 In Zeno Clash, you’ll perhaps find some of the most shockingly creative landscapes and creatures that you have seen in a long time in a game. The games’ anarchist world is inhabited by some very interesting characters such as the insane Corwid of the Free and the game’s antagonist, Mother- Father. There is a pretty deep storyline for an action game which is effectively narrated through alternate reality and flashbacks. The game is pretty short though, and we would be heading into spoiler territory if we wrote much more about the game details. Initially, I found the game pretty challenging and at one point even considered taking the game difficulty down a notch. In spite of this, I would peg the games’ length between five to six hours; which is if you only consider the single–player campaign. Finishing the game unlocks the Challenge Mode towers – something that should keep you busy for another few hours. This mode also has an online leader-board, in case you want to show your friend who is the better man. At $14.99 (roughly Rs. 750) I would recommend this game to all who have access to games on Steam – if only for the game’s compelling art style and character design.